Contact Kendall Toyota of Bend today for information on dozens of vehicles like this 2019 Toyota Highlander LE. This Toyota includes: ROOF RACK CROSS BARS (PPO) Luggage Rack REAR BUMPER PROTECTOR (TMS) (PPO) 50 STATE EMISSIONS *Note - For third party subscriptions or services, please contact the dealer for more information. * This SUV gives you versatility, style and comfort all in one vehicle. Navigate through all the icky weather with ease in this AWD-equipped Toyota Highlander, and even get non-stop traction for your non-stop lifestyle! In addition to the amazing traction control, you may even qualify for an insurance reduction with this AWD vehicle. The Toyota Highlander LE will provide you with everything you have always wanted in a car -- Quality, Reliability, and Character. Contact Kendall Toyota of Bend today for information on dozens of vehicles like this 2019 Toyota Highlander LE Plus. This Toyota includes: REAR BUMPER PROTECTOR (TMS) (PPO) 50 STATE EMISSIONS *Note - For third party subscriptions or services, please contact the dealer for more information. * Want more room? Want more style? This Toyota Highlander is the vehicle for you. You'll love the feel of AWD in this 2019 Toyota Highlander. It provides a perfect balance of handling power and control in virtually every driving condition. The 2019 Toyota exterior is finished in a breathtaking Predawn Gray Mica, while being complemented by such a gorgeous Ash interior. This color combination is stunning and absolutely beautiful! This 2019 Toyota Highlander LE is proudly offered by Kendall Toyota of Bend This Toyota includes: ROOF RACK CROSS BARS (PPO) Luggage Rack REAR BUMPER PROTECTOR (TMS) (PPO) SPECIAL COLOR 50 STATE EMISSIONS *Note - For third party subscriptions or services, please contact the dealer for more information. * This SUV gives you versatility, style and comfort all in one vehicle. This vehicle has an added performance bonus: AWD. It improves handling on those winding back roads, and gives you added safety and control when driving through wet and snow weather conditions. You can finally stop searching... You've found the one you've been looking for. 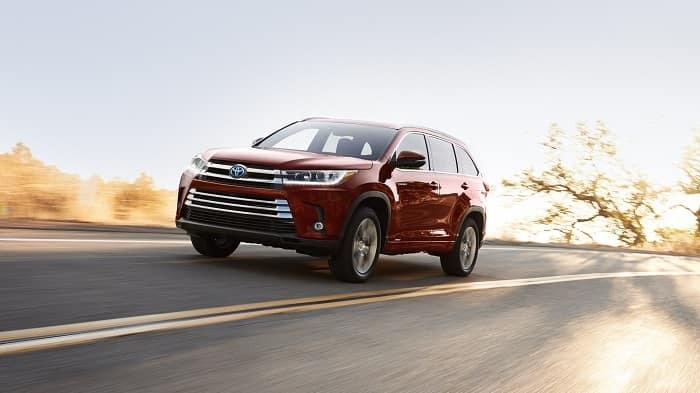 Contact Kendall Toyota of Bend today for information on dozens of vehicles like this 2019 Toyota Highlander Hybrid LE. This Toyota includes: SPECIAL COLOR ROOF RACK CROSS BARS (PPO) Luggage Rack 50 STATE EMISSIONS *Note - For third party subscriptions or services, please contact the dealer for more information. * Want more room? Want more style? This Toyota Highlander is the vehicle for you. All-wheel drive means peace of mind all the time. This Blizzard Pearl AWD Toyota enjoys a host offeatures, including exceptional acceleration and superior stability so you can drive with confidence. Beautiful color combination with Blizzard Pearl exterior over Ash interior making this the one to own! This outstanding example of a 2019 Toyota Highlander XLE is offered by Kendall Toyota of Bend. This Toyota includes: 50 STATE EMISSIONS SEATING FOR 8: 2ND ROW 60/40 BENCH SEAT Rear Bench Seat Pass-Through Rear Seat *Note - For third party subscriptions or services, please contact the dealer for more information. * Want more room? Want more style? This Toyota Highlander is the vehicle for you. You appreciate the finer things in life, the vehicle you drive should not be the exception. Style, performance, sophistication is in a class of its own with this stunning Toyota Highlander. Enjoy the grip and control of AWD performance in this nicely equipped Toyota Highlander. This outstanding example of a 2019 Toyota Highlander XLE is offered by Kendall Toyota of Bend. This Toyota includes: 50 STATE EMISSIONS BODY SIDE MOLDING (TMS) (PPO) *Note - For third party subscriptions or services, please contact the dealer for more information. * Want more room? Want more style? This Toyota Highlander is the vehicle for you. You appreciate the finer things in life, the vehicle you drive should not be the exception. Style, performance, sophistication is in a class of its own with this stunning Toyota Highlander. Hit the gas pedal and put the engine power to all four wheels. With AWD, you'll have the greater performance right off the line, everytime you drive. Kendall Toyota of Bend is excited to offer this 2019 Toyota Highlander. This Toyota includes: 50 STATE EMISSIONS REAR BUMPER PROTECTOR (TMS) (PPO) ROOF RACK CROSS BARS (PPO) Luggage Rack *Note - For third party subscriptions or services, please contact the dealer for more information. * Want more room? Want more style? This Toyota Highlander is the vehicle for you. There's a level of quality and refinement in this Toyota Highlander that you won't find in your average vehicle. You'll love the feel of AWD in this 2019 Toyota Highlander. It provides a perfect balance of handling power and control in virtually every driving condition. Kendall Toyota of Bend is excited to offer this 2019 Toyota Highlander. Want more room? Want more style? This Toyota Highlander is the vehicle for you. Few vehicles can match the safety and comfort of this AWD Toyota Highlander Hybrid LE. With enhanced performance, refined interior and exceptional fuel efficiency, this AWD Toyota is in a class of its own. Just what you've been looking for. With quality in mind, this vehicle is the perfect addition to take home. You can finally stop searching... You've found the one you've been looking for. Contact Kendall Toyota of Bend today for information on dozens of vehicles like this 2019 Toyota Highlander SE. This Toyota includes: ROOF RACK CROSS BARS (PPO) Luggage Rack 50 STATE EMISSIONS *Note - For third party subscriptions or services, please contact the dealer for more information. * Want more room? Want more style? This Toyota Highlander is the vehicle for you. You appreciate the finer things in life, the vehicle you drive should not be the exception. Style, performance, sophistication is in a class of its own with this stunning Toyota Highlander. Once you see this Toyota, you'll quickly see that this is the perfect vehicle for the outdoor junky! You'll even feel relaxed knowing that this All-Wheel drive vehicle will get you to where you are going no matter what may come your way. Also, with this Toyota Highlander's dependable control you'll be able to drive into the sunset without a care in the world! This outstanding example of a 2019 Toyota Highlander SE is offered by Kendall Toyota of Bend. This Toyota includes: ROOF RACK CROSS BARS (PPO) Luggage Rack 50 STATE EMISSIONS REAR BUMPER PROTECTOR (TMS) (PPO) *Note - For third party subscriptions or services, please contact the dealer for more information. * Want more room? Want more style? This Toyota Highlander is the vehicle for you. You appreciate the finer things in life, the vehicle you drive should not be the exception. Style, performance, sophistication is in a class of its own with this stunning Toyota Highlander. This Toyota Highlander is equipped with AWD for improved handling. Whether you're faced with inclement weather or just out enjoying the twisting back road, you'll have the grip of AWD on your side. This outstanding example of a 2019 Toyota Highlander Limited is offered by Kendall Toyota of Bend. This Toyota includes: SEATING FOR 8: 2ND ROW 60/40 BENCH SEAT Rear Bench Seat Pass-Through Rear Seat BODY SIDE MOLDING (TMS) (PPO) REAR BUMPER PROTECTOR (TMS) (PPO) 50 STATE EMISSIONS *Note - For third party subscriptions or services, please contact the dealer for more information. * Want more room? Want more style? This Toyota Highlander is the vehicle for you. There's a level of quality and refinement in this Toyota Highlander that you won't find in your average vehicle. Enjoy the grip and control of AWD performance in this nicely equipped Toyota Highlander. Contact Kendall Toyota of Bend today for information on dozens of vehicles like this 2019 Toyota Highlander XLE. This Toyota includes: 50 STATE EMISSIONS SEATING FOR 8: 2ND ROW 60/40 BENCH SEAT Rear Bench Seat Pass-Through Rear Seat *Note - For third party subscriptions or services, please contact the dealer for more information. * Want more room? Want more style? This Toyota Highlander is the vehicle for you. You appreciate the finer things in life, the vehicle you drive should not be the exception. Style, performance, sophistication is in a class of its own with this stunning Toyota Highlander. Enjoy safety and stability with this all-wheel drive vehicle and drive with confidence in any condition. Contact Kendall Toyota of Bend today for information on dozens of vehicles like this 2019 Toyota Highlander XLE. Want more room? Want more style? This Toyota Highlander is the vehicle for you. You deserve a vehicle designed for higher expectations. This Toyota Highlander delivers with a luxurious, well-appointed interior and world-class engineering. No matter the varying terrain or weather conditions, this all-wheel drive vehicle will help you reach your destination safely and securely in a well-appointed cabin with many features found on cars twice the price. The look is unmistakably Toyota, the smooth contours and cutting-edge technology of this Toyota Highlander XLE will definitely turn heads. This outstanding example of a 2019 Toyota Highlander XLE is offered by Kendall Toyota of Bend. Want more room? Want more style? This Toyota Highlander is the vehicle for you. Pull up in the vehicle and the valet will want to parked on the front row. This Toyota Highlander is the vehicle others dream to own. Don't miss your chance to make it your new ride. Take home this 2019 Toyota Highlander and enjoy the safety and added performance of AWD. Just what you've been looking for. With quality in mind, this vehicle is the perfect addition to take home. This 2019 Toyota Highlander Limited is proudly offered by Kendall Toyota of Bend This Toyota includes: 50 STATE EMISSIONS *Note - For third party subscriptions or services, please contact the dealer for more information. * This SUV gives you versatility, style and comfort all in one vehicle. There's a level of quality and refinement in this Toyota Highlander that you won't find in your average vehicle. Take home this 2019 Toyota Highlander and enjoy the safety and added performance of AWD. Contact Kendall Toyota of Bend today for information on dozens of vehicles like this 2019 Toyota Highlander XLE. Want more room? Want more style? This Toyota Highlander is the vehicle for you. You appreciate the finer things in life, the vehicle you drive should not be the exception. Style, performance, sophistication is in a class of its own with this stunning Toyota Highlander. This vehicle has an added performance bonus: AWD. It improves handling on those winding back roads, and gives you added safety and control when driving through wet and snow weather conditions. The look is unmistakably Toyota, the smooth contours and cutting-edge technology of this Toyota Highlander XLE will definitely turn heads. Contact Kendall Toyota of Bend today for information on dozens of vehicles like this 2019 Toyota Highlander XLE. This Toyota includes: 50 STATE EMISSIONS SEATING FOR 8: 2ND ROW 60/40 BENCH SEAT Rear Bench Seat Pass-Through Rear Seat REAR BUMPER PROTECTOR (TMS) (PPO) *Note - For third party subscriptions or services, please contact the dealer for more information. * Want more room? Want more style? This Toyota Highlander is the vehicle for you. Pull up in the vehicle and the valet will want to parked on the front row. This Toyota Highlander is the vehicle others dream to own. Don't miss your chance to make it your new ride. This Toyota Highlander is equipped with AWD for improved handling. Whether you're faced with inclement weather or just out enjoying the twisting back road, you'll have the grip of AWD on your side. You can find this 2019 Toyota Highlander XLE and many others like it at Kendall Toyota of Bend. Want more room? Want more style? This Toyota Highlander is the vehicle for you. You appreciate the finer things in life, the vehicle you drive should not be the exception. Style, performance, sophistication is in a class of its own with this stunning Toyota Highlander. Enjoy driving? Well now you will get more thrills behind the wheel thanks to the heightened performance of AWD. Better handling. Better traction. Better driving experience. You can finally stop searching... You've found the one you've been looking for. You can find this 2019 Toyota Highlander Limited and many others like it at Kendall Toyota of Bend. This Toyota includes: 50 STATE EMISSIONS ROOF RACK CROSS BARS (PPO) Luggage Rack *Note - For third party subscriptions or services, please contact the dealer for more information. * Want more room? Want more style? This Toyota Highlander is the vehicle for you. You appreciate the finer things in life, the vehicle you drive should not be the exception. Style, performance, sophistication is in a class of its own with this stunning Toyota Highlander. This AWD-equipped vehicle handles well in any weather condition or terrain. You'll benefit from superb handling, improved steering and excellent acceleration. Contact Kendall Toyota of Bend today for information on dozens of vehicles like this 2019 Toyota Highlander XLE. This Toyota includes: 50 STATE EMISSIONS SEATING FOR 8: 2ND ROW 60/40 BENCH SEAT Rear Bench Seat Pass-Through Rear Seat REAR BUMPER PROTECTOR (TMS) (PPO) *Note - For third party subscriptions or services, please contact the dealer for more information. * Want more room? Want more style? This Toyota Highlander is the vehicle for you. Pull up in the vehicle and the valet will want to parked on the front row. This Toyota Highlander is the vehicle others dream to own. Don't miss your chance to make it your new ride. Enjoy driving? Well now you will get more thrills behind the wheel thanks to the heightened performance of AWD. Better handling. Better traction. Better driving experience. If the Toyota Highlander sounds like the SUV you and your family have been dreaming of, the team here at Kendall Toyota of Bend agrees that this model is perfect for tackling Oregon terrain. Come by our Toyota dealership’s convenient location at 61430 S Hwy 97 Bend, Oregon 97702 to take a test drive in the Toyota Highlander today. If you have any questions or concerns before stopping by, we’d be happy to answer them–contact us for additional information about any of the models available in the new Toyota lineup. The whole team here at our dealership can’t wait to work with you soon!